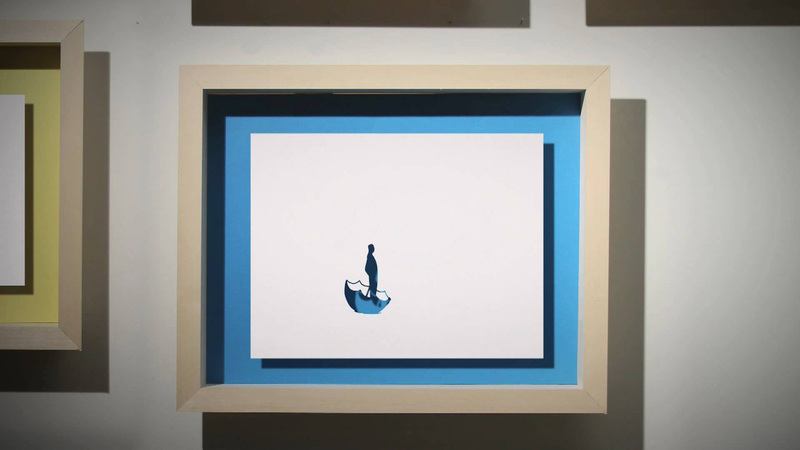 Floaty dreamlike animation from Kenneth Onulak. This is my Junior Degree Project that I worked over the Spring semester at RISD. I got the original concept of creating a cutout animation for art made with a single sheet of paper and the stratastencil technique. To create the final look of the film, I started with a basic mockup frame that I used to make rough style frames and an animatic with. Later applying the animation over the animatic to create a fine cut, while using it to do render tests and get a feel of how he workflow was going to work out. From there I made the final frame and created 7 colored backings for it, which I swapped out while hanging the frame in different places on the wall. I lit the frame to give it the shadows in the image and used these pictures later, compositing them together so that they were all hanging on the wall at the same time. All of this came together over a 12 week period to create this final film.